What Types of Ankle Injuries Require Surgery? Ankle injuries can put a damper on your everyday life. Unfortunately, ankle injuries are very common and some injuries are so severe that ankle surgery is needed. If you are suffering from one of these common ankle injuries, you may need ankle reconstructive surgery to find relief. An ankle fracture is when there is a partial or complete break in the bone. Some fractures are so severe where it ends up shattering the tibia, fibula, or even both. To repair an ankle with this type of injury, surgery is needed. To fix a fibula or tibia fracture, a stable internal fixation is screwed into the bone. This plate will help keep the portion of the bone aligned so it can heal properly. Be prepared to not place weight on the foot for 3 to 10 weeks, followed by wearing a boot or cast until fully healed. Physical therapy will also be a helpful addition. A past injury can damage the ankle, or even lead to arthritis. The best way to find pain relief is through surgery, which can help active people get back to their daily routines. First, an incision is made to remove the fibula. The doctor will then reshape the bone and correctly align the joints. Keep in mind that bone grafting might be required to fill the gaps for proper alignment. Screws and plates will be used to secure everything together, stabilizing the joint. A cast and crutches will be needed for 6 to 8 weeks during recovery. After the bones are fused together, weight can then be placed on the foot. However, it will take about 3 to 6 months for the healing process to be complete. When ligaments are torn or stretched, this can cause instability in the ankle. If regular treatment options don’t seem to help, lateral ankle ligament reconstruction surgery may be needed. The Brostrom Gould technique is used and places stitches and anchors in the fibula bone to tighten the ankle ligaments. Dissolving stitches are used and a splint is applied after surgery. Once the swelling goes down, a cast is typically worn for 3 to 4 weeks. However, you won’t be able to put weight on your foot for about 4 to 6 weeks. Keep in mind this will be a long recovery with a full recovery taking 6 to 12 months. You will also need physical therapy throughout the recovery process. To repair damaged cartilage in the ankle joint, reconstructive ankle surgery could be very beneficial. Cartilage has a hard time regenerating after it has been damaged. If not treated properly, this can lead to even more damage to the tissue causing swelling, pain, and restricted mobility. Using arthroscopic guidance, a cartilage graft is placed. This usually leads to fast recovery with just the need of a walking cast and the need to stay off the feet for just a few weeks. 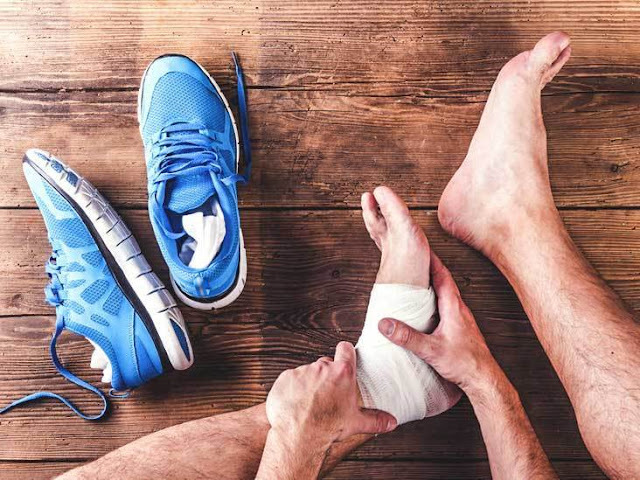 When ankle surgery is needed to treat your ankle injury, the Arizona Foot and Ankle Center provides you with the finest foot and ankle care to get you back on your feet. As one of the top podiatrist Scottsdale, the Foot and Ankle Center of Arizona uses only the highest quality equipment and provides the leading surgical techniques to help you find relief.